We are St. Louis Wildlife, Inc. a full-service wildlife removal company servicing the greater Saint Louis MO area. We resolve conflicts with unwanted skunks. When Can You Solve My Skunk Problem? Common problems caused by skunk include: living under a shed or deck, eating pet food, and causing odor problems. 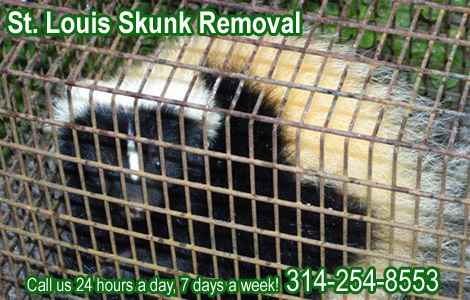 Our company specializes in wild animal control, including St. Louis skunk removal. We are not a pest control company, or an exterminator. We deal strictly with wild animals. We are also not the Saint Louis county animal control, and we do charge for our services. Skunk deterrent - Do moth balls work? Moth balls as a skunk deterrent or repellent are about as worthwhile as ice-skates in Hawaii. There may be some application, but not enough that you should waste your time or money. The problem with moth balls is that they are supposed to rid the world of every pest imaginable, when they were only really created to fumigate against certain insects. The fumes from moth balls can definitely give a person a head ache and can cause serious respiratory issues for people if concentrations are too high. To use moth balls as the effective deterrent level would mean that you would not be able to live in your home any more than a skunk would. Not only are skunks indifferent toward moth balls, they could easily escape the chemical if they wanted to. Once a skunk is inside of the home or under a shed or deck, there is virtually nothing that can be done to make that animal leave—except trapping and removal. Skunks can slip into the most hidden areas of the home, far away from any weak fumes that may waft off of a box of moth balls. And speaking of fumes, the fumes of a skunk are far worse than those of mothballs! Because of the destruction these animals can cause inside or under a home, waiting for moth balls to drive them out is not advised. Before the animals do significant damage, they should be trapped and removed. Read more about The best way to get rid of Skunks.